Do you want to take your quilting to the next level? In this drawing class learn to incorporate quilting elements as a main design element, not just an afterthought. Students will learn to design quilting elements that add an extra “layer” of design to the quilt. Look beyond the shapes made by the piecing to create a new design element that complements the design of the entire quilt. Utilize the idea of macro quilting to create elements that are on the same scale as the piecing. Learn how scale and density effect what the eye sees. Get even more out of Creative Studio by creating your own patterns with a few simple clicks. The first part of the class will focus on creating several simple patterns. We will spend the remainder of the class learning how to use those new patterns in powerful ways to create a custom look and feel that will take your quilting to the next level. The tools and features highlighted in this class include: Draw arc/line/pattern; Apply pattern; Circular array; Fill/boundaries; Saving Patterns; and Pattern properties. This class will be taught in SAM. You will be amazed how much you can learn! Have you ever been able to draw a design that you would like to quilt, but could not find a pattern that was close enough? If so, this class is for you! Understanding all that can be done with the seemingly simple Draw Arc tool in Creative Studio will change your approach to digital quilting. Using imported images of a design you would like to quilt, you will learn tricks and tools to digitize designs from your chosen image. Tools and features highlighted in this class include: Import image; Draw arc; Order join; Nodes; and Saving Patterns. This class will be taught in SAM. After this class, you will definitely be using the Draw Arc tool to enhance your custom quilts. Being able to create you own unique pattern can make your custom quilting really special. In this class, you will learn a couple of approaches to creating custom patterns utilizing patterns that you already own. You will learn how to draw a block in CAD and create custom patterns, for the block you created. Tools and features highlighted in this class include Draw line/arc; Fill; Boundaries; and Saving Patterns. This class will be taught in SAM. 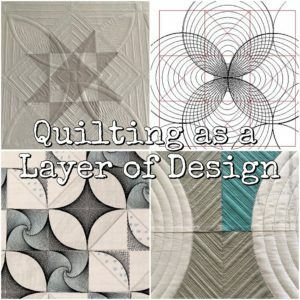 Discussion will focus on finding the ‘right’ pattern to get the job done, as well as touching on design principles that make a quilting design pop. Take your understanding of “fill” to a whole new level. We will use simple patterns to create background fills that seemingly flow behind foreground elements. Learn to use a “Master Pattern” to create multiple fills that limit the edge stitching found in more ‘typical’ fills for a fully custom design. Tools and features highlighted in this class include: Boundaries; Fill; Pattern manipulation; Nodes; Relocate; and Pattern properties. This class will be taught in SAM. Your custom quilts will stand out and your customers will be amazed at what you can do. Modern quilts pack a lot of WOW factor, but can seem intimidating. Explore effective approaches of tackling these modern beauties by utilizing a whole quilt layout method that will be overlaid on a photo of the quilt. Designing digitally will allow you to design elements on the same scale as the piecing, and use methods and patterns that you already know. Design a roadmap of all the quilting designs that you will use ahead of time. The designs will be broken down into ‘stitchable’ sections to maximize your throat space. Tools and features highlighted in this class include Import Image; Draw line/arc; Fill; Boundaries; Apply and Relocate. This class will be taught in SAM. This class will include an in-depth discussion of what makes a modern quilt; design approaches appropriate for modern quilts; and guidance on choosing the ‘right’ pattern(s). Stitch in the Ditch (SID) can make or break a custom quilt. There is no need to dread SID on your next custom quilt. Instead, embrace the Statler tools you already know that will have you using SID like a pro. In this class, you will master digital ditch work without a ruler. Highlights of tools and features include; Draw line/arc; Toolbar customization; Controller definitions; Getting your laser in sync with the needle; Tie and bury threads; Quilt stabilization and basting; and ‘surfing’ with a ruler base. We will also focus on troubleshooting methods of how to deal with seams that are pressed to the side or open and what to do when the points don’t match. Each student will have some hands on practice time on the Statler. You will leave this class with a new appreciation for SID, and new tools to take that next custom quilt to the next level.